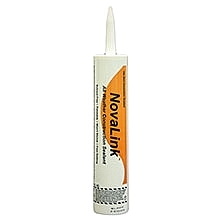 DESCRIPTION: NovaLink is a solvent-free, 100% solids silyl terminated Polyether high-performance exterior/interior caulking sealant. Can use in damp, dry, or cold climates. Use for expansion joints and sealing joints of dissimilar materials, or general purpose exterior/interior caulking and sealing. Can be applied to surfaces down to 30F (but keep product indoors 70 F before applying). Handles up to 1" wide joints with +/- 35% movement. Quick Curing: Cures quicker than Polyurethane based products. Solvent free, 100% solids, will not shrink. Very Odor (mild mint smell): Can be used indoors. 30-45 Minute skin over, paintable within 24 hours. Easy to gun and tool in colder weather. OPTIONS: Duralink (High adhesion, 2 inch joints with +/-50% movement). MEDIUM DUTY CAULK GUN, DRIPLESS, SKELETON TYPE, 10.3OZ STANDARD CARTRIDGE, 7:1 MECHANICAL ADVANTAGE, THUMB ACTIVATED PRESSURE RELIEF, RETRACTABLE SEAL PUNCTURING ROD, HEX DRIVE ROD, BUILT IN LADDER HOOK, (SIMILAR TO COX 41001 WEXFORD II). PRICE/EACH. Newborn Model 250 Caulk Gun. 1/10-gallon super-smooth feed, 18:1 high-thrust. For use with any sealant or adhesive. Includes a revolving barrel, a ladder hook for added ease of use, dripless thumb release. Price/Each.